My favorite place in Chicago? That’s an easy question to answer. It sits squarely in the center of downtown, presided over by two (not so) imposing lions. 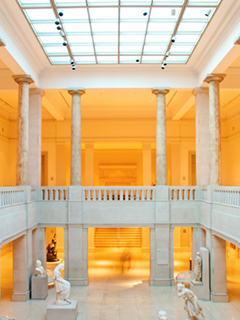 The Art Institute has a firm grip on my heart and I wouldn’t have it any other way. Very early on, I figured out I had no artistic ability whatsoever. Can’t draw, can’t paint, none of that. But even as a little one, I looked very forward to the special days peppered throughout elementary and middle school known as “Art in Action.” As a fourth grader, I remember looking at pictures by someone who I later came to recognize as Andrew Wyeth, but at that age simply wondering what the figures in his paintings were reaching for in the fields. I loved the look of portraits, of distinguished men and women wearing expressions that seemed thoughtful and grown up. I remember the swirls and twirls of Van Gogh paintings as they were revealed to us in front of the classroom, pictures lying in the sill of the chalkboard, wondering what it would be like to travel to a place that could possibly inspire that interpretation of the sky. While growing up, I thought art was about drawing and I resigned myself to the “not naturally talented” camp. But in eighth grade I learned the beginnings of art history from my oh-so hippie art teacher and it sparked a curiosity that remains with me today. I so clearly remember sitting at a drafting table, my feet clad in Sketchers dangling beneath me, learning about Caravaggio and chiaroscuro. In high school, I made it my mission to commit all of the French Impressionists to memory, from Monet to Degas and all in between. I loved all the French painters; I would scan my European history books and look for paintings by the famed Delacroix, for the beautiful lines of the fabled Ingres. In high school, both my love for the French language and for all things art history grew. With occasional trips to the Art Institute with my family, I only grew more curious as to how someone could complete an entire painting solely with dots (Sunday at La Grande Jatte), the meaning of Mona Lisa’s smile, how artists grew up and became to inhabit their notoriety. Like I said, my love for French and art blossomed pretty simultaneously and my moments of “Frashley” only cultivated that fascination further. Living in Provence, we learned about light, how form and content overlap and influence one another and most importantly, patience. Patience to look at a painting for a half an hour and parse out what it is getting at, patience with studying an artist’s lifetime and being able to pick out nuance from each decade of their work. 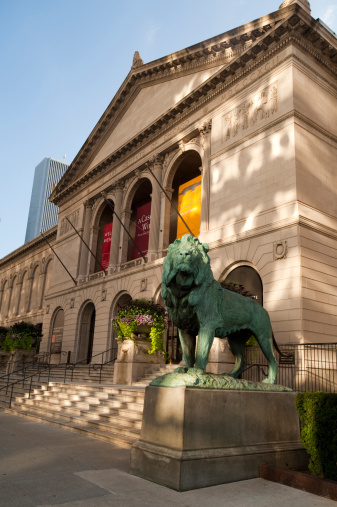 When I moved to downtown Chicago, I knew right away that a membership to the Art Institute was in the cards. After all, I tried to make it to as many free days as I could over the years. Wouldn’t it be nice to sort of always go for free? I thought it would make a nice Chanukah present, but truth is, I couldn’t wait that long. It’s one of the few places that calm my frenetic nerves, one of the places I feel I can truly take my time. I love to go and look at the Chagall windows. Talk about one of my favorite things in the city. I have a soft spot for Chagall, naturally. The stained glass windows are located in a funny corner of the museum, sort of hidden. But just looking at the blues and the yellows … it’s a chance to take a minute away from busy Chicago and busy life around me and think about turn of the century Vitebsk, Chagall’s home town. Looking at Chagall’s creations turns my thoughts to Judaism, often. Through his craft, he gives insight into what it was to be Jewish at that time; through his sketches, he imparts a fanciful depiction of a time and place in Eastern Europe and later France that feels faraway yet close. Something about how he expressed himself transports me to a different frame of mind. I particularly love the paintings of floating figures—figures in love. He made his mark as a Jewish artist through metaphor and with care, which makes him one of my favorites to visit at my most favorite of places. I often think about passion, about my short stint in France and how I can bring what I learned there over here. The Art Institute indulges my artsy-fartsy moments and encourages me to keep on dreaming, no matter where I’m at in the world of the world.